Dr. Kim Dittus joined Chef Curtiss and Judy Simpson on the University of Vermont's Across The Fence program to discuss breast cancer nutrition, diet and exercise for those in the community that have been touched by breast cancer. On set Chef Curtiss demonstrated some simple techniques for including the whole family in the meal, from start to finish. we did a rustic breakfast sausage and some gluten free maple oatmeal pancakes. The food we take in has an impact on our lives, with or without cancer's presence at the table. For those living with cancer, or those at greater risk for certain types of cancer, diet can be one of the only variables that you are directly in control over. Just as each of us is unique, so to are our set of likes and dislikes. We know that a "one-size-fits-all" approach to food doesn't work. In order to provide meaningful resources to everyone affected by cancer we had to provide a framework, better yet a philosophic view of what food should be. Not only what food should be from a nourishment and energy standpoint, but also what food offers us as a source of pleasure and a connection to our community. 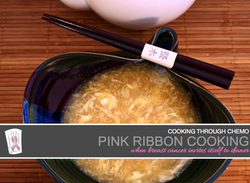 Below is a list of the principles that guide Pink Ribbon Cooking™ and remind us why we cook, why we share the table and why it matters. Please feel free to openly adopt this list or to create your own and share it with us, or the world." 1. Food should be enjoyed in its freshest and most natural states. 2. Good cooking can only be the result of good ingredients, so choose great ingredients! 3.For the most part I do not believe in the use of artificial or processed foods as mainstay ingredients, as they offer little flavor or appeal. However, some are excellent background ingredients that otherwise would be the source of empty calories and nutrients. 4. Simple and healthy food is the by-product of understanding yourself, your palate and your specific nourishment goals. Food is the fuel of the body. 5. Big flavors in small packages make up for big packages with small flavor. It is the law of diminishing returns, that after four bites we are ready for the next dish. 6. Every recipe has a point from which the flavor of an ingredient can be maximized. Knowing this point helps us eliminate many of the empty calories and nutrients in most foods we consume. 7. Simple healthy food relies on the unification of our senses and the ability to understand how important flavor is to each of them. 8. Eating is only as good as the company of the meal. Share with others! 9. Good cooking is work well rewarded with great satisfaction. 10. Be happy! Enjoy the meal at every step from planning, shopping, cooking, serving, eating and cleaning. Few things we work at taste this good. Kitchens can be great places to relax and focus our energy. Feel free to download this image, print it and place it on your refrigerator door or in your kitchen. A picture is worth 1,000 words! Each of us has the ability to create a list of guiding principles that we can refer to as we make our food choices and diet plans. Pink Ribbon Cooking™ recognizes this and is designed to give you the tools to have relevant and essential recipes, techniques and, more than anything else, knowledge about the cooking process. Knowledge is power and power can be the catalyst for change. If you are in treatment or know of someone touched by breast cancer please enjoy this free digital book. It is full of great information during this difficult life moment.